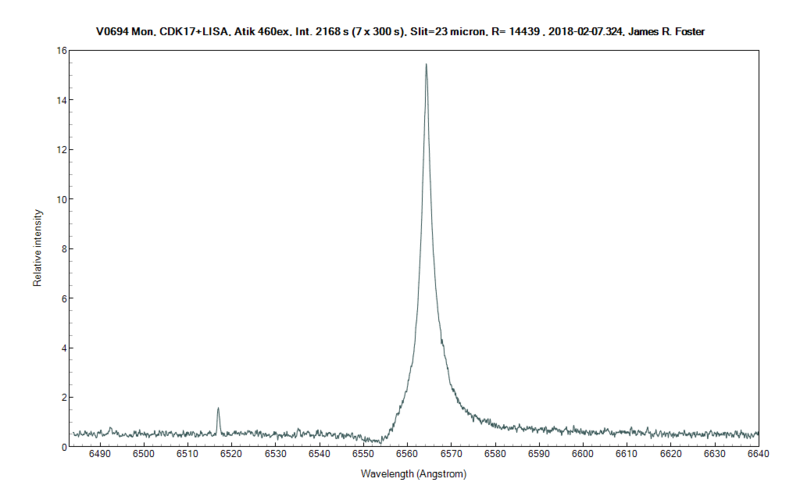 I recently recorded low resolution spectra for V694 Mon [MWC560] and as expected the H Balmer absorption troughs are narrower than in spectra recorded early last year, shortly after the major outburst. I have a basic understanding of how the absorption troughs relate to polar jet velocity, however, I am puzzled by the difference in the absorption troughs for Fe II 4924, 5018 and 5169 which are significantly larger now than those recorded 2016 April. Can anyone shed a little light on how the Fe II lines would be affected by the polar jet velocity, making the assumption that the Fe II lines have their origin in the accretion disk, and, what the difference in the Fe II absorption troughs may indicate? Any input would be very much appreciated. Only the *emission* component of metal lines - Fe, Ti, Mg ... - have a low FWHM (about 20 km/s, 40 km/s with a broader pesdestrial for Fe II (42) multiplet) and are considered to be produced essentially in the accretion disk, the nebula anf jet near the hot component of the sytem. V694 Mon is highly variable, even from night to night. Accretion rate may be the origin of the variablity. During the last optical outburst in 2016, an strong enhancement of the maximupm absorption velocity was expected, but ... didn't occured. V694 Mon is an "exotic" object. Your spectra are nice. Instrumental and atmospheric correction should be the next step. Thank you, Francois, for the clarification on the Fe II absorption trough differences. Patiently waiting for clear skies here in 'sunny' California. Should night skies ever clear, I intend to record a series of spectra to look for short period variations in the Fe II absorption. A project, it would seem, well within the capability of the Alpy 600. Again, thank you for the information and encouragement. Following new questions, here's a model adapted from Schmid & al. The narrow emission lines of hydrogen and ionised metals (Fe II, Ti II, Cr II, Si II ..) are emitted from a large part of the disk. These are narrow lines. From a spectrum obtained two days ago, I get FWHM of 30-35 km/s for most of the lines. Only Fe II 42 multiplet gives broader lines (50 km/s). The jets is formed by the solar ionised matter (at least at the begining). The recombination time is long. So the ions can absorbe the photons of the continuum at the blue shift wavelenght produced by their velocity. This is the reason why the absortions are much wider than the emission. They are not formed in the some region of the sytem. For Fe II (42) about 25% of the photons of the continuum are absorbed. While HI can absorbed about 75% of the photons due to its higher column density. 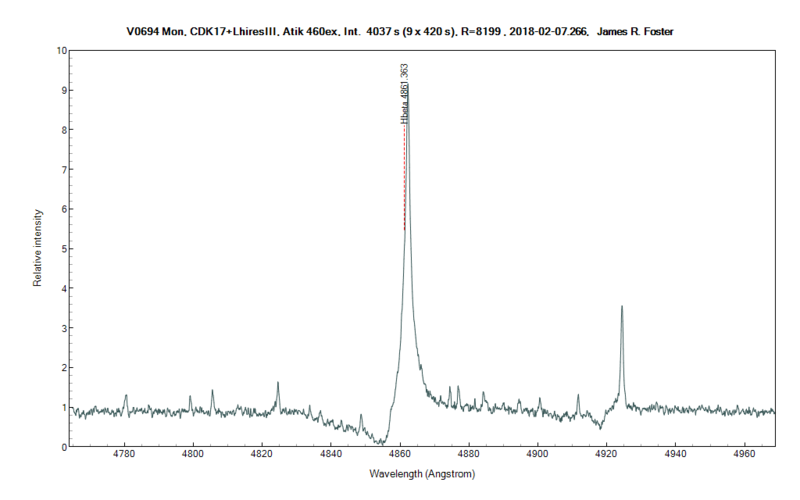 This is a new spectra of V694 Mon. The broad absorptions seem to get narrower with increasing wavelength. Is that because shorter wavelengths are produced near the center of the disk,which results in more coverage by the jet = more dispersion of velocities? Does the Red Giant account, in part, for the small H-alpha absorption? Il y a beaucoup de choses à observer et à comprendre. Beaucoup de questions. Merci Francois pour le dessin. Le spectre est très bon au niveau de la résolution. Merci pour le schema explicatif c'est top ! Thanks to Francois Teyssier for the beautiful graphic on this interacting symbiotic! 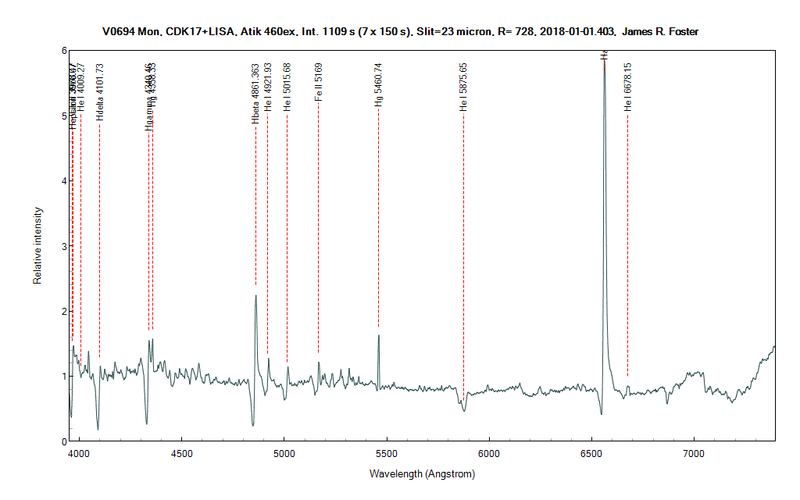 I had to apply a low-pass Gausian to my LhiresIII CaK data because of the faintness of the Spectra in this band even after exposing over 2 Hrs! 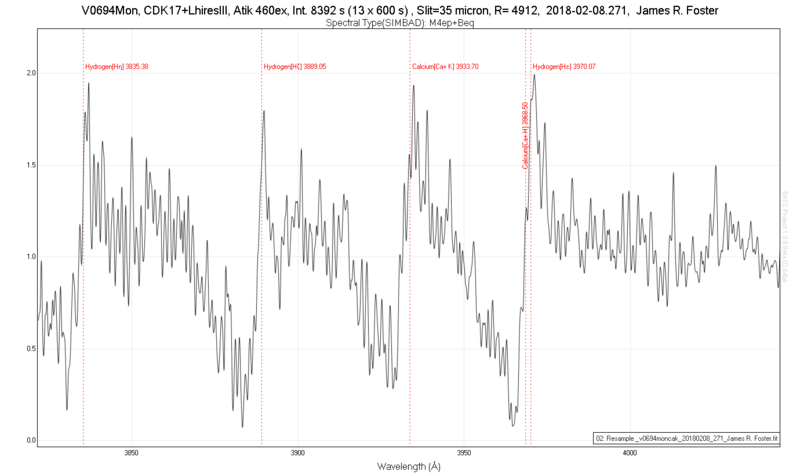 I used HD071155 for my Ha/Hb IRC star on 07Feb18and HD045067 for my IRC star for the Cak data on 08Feb18; both around 0 deg declination. Merci François. Le spreadsheet ReferenceStarFinder sera très util. Je n'ai pas traité ce specturm avec ISIS et je pense que la réponse instrumentale n'était pas correcte. J'ai essayé encore et bien que la réponse soit meilleure, je ne pense pas que cela corresponde parfaitement à la référence A0V. Je vais essayer à nouveau avec ISIS et choisir une autre étoile la prochaine fois.